UpBit is a relatively new cryptocurrency exchange which has seen exponential growth in a very short time. The exchange was only launched in October of 2017 and is already the largest cryptocurrency exchange by daily trading volume. UpBit holds the record for the highest daily trading volume at $11 billion traded in one day, and an average daily trading volume of $4.5 billion in December 2017. UpBit’s success and popularity comes as no surprise as they are owned and operated by Dunamu, Korea’s second most popular search engine. Also, UpBit is partnered with Kakao Corp, an internet company with multiple highly successful businesses such as Korea’s biggest messaging app, a popular payments app, and a taxi service app like Uber. Furthermore, UpBit is partnered with one of America’s most popular cryptocurrency exchanges, Bittrex. All these successful partnerships have led UpBit to the top, and the exchange continues to offer reputable and highly liquid cryptocurrency trading services. UpBit’s headquarters are based in Seoul, South Korea at Gangnam-gu, Teheranro 4-gil 14, 5th floor, under the business registration number 119-86-54968. UpBit has yet to become regulated by the Korean regulatory authorities but works in compliance with their laws and regulations in order to be regulated one day. While UpBit appears to be a reputable online cryptocurrency exchange, are they? Find out, in the following review where we’ll delve deep into the aspects that make up this cryptocurrency exchange and see what sets UpBit apart from the competition and whether or not they can be trusted. UpBit features their very own proprietary web-based exchange platform which is only available in the Korean language as UpBit is a Korean cryptocurrency exchange. However, the platform is still accessible internationally and can be translated using Google Translate which works very well.Although the platform allows international cryptocurrency traders, every trader will need Kakao Talk and Kakao Pay accounts with a South Korean mobile carrier. Therefore, if you live in a country other than South Korea it is significantly more difficult to open an account with UpBit. As for the exchange platform itself, the platform strongly resembles the KakaoStock platforms and is essentially the same platform but for cryptocurrency. The platform is available on desktop computers via a web browser and mobile smart devices via a downloadable application on the Apple App Store or Google Play Store. Some of the key aspects of the exchange platform are high quality charting capabilities, technical analysis, and a comprehensive newsfeed. UpBit is a cryptocurrency exchange and does not support trading in any other markets besides cryptocurrencies. The exchange features over an extensive list of over 100 cryptocurrencies to be traded. These cryptos are primarily apart of the top 100 coins and are for the most part decent investments rather than scam coins. UpBit does their best to choose the cryptos they feature wisely. As for the trading pairs features of UpBit, traders can buy and sell cryptos for the Korean Won (KRW), Bitcoin (BTC), Ethereum (ETH), and Tether (USDT). Bitcoin has the most trading pairs, followed by Ethereum, the Korean Won, and then Tether. UpBit offers their traders standard cryptocurrency exchange fees which are neither low nor high compared with the Korean markets. Deposits for all units of currency are free of charge, while withdrawals vary from crypto to crypto but are very low and withdrawal fees for the Korean Won are 1000 KRW. As for the trading fees, they are comparable with most other Korean cryptocurrency exchanges with fees of 0.25% for both makers and takers. Compared with some of the other top international cryptocurrency exchanges, UpBit’s fees are rather high but not in comparison with other Korean cryptocurrency exchanges. The UpBit cryptocurrency exchange is backed by one of South Korea’s largest internet fintech companies, Kakao. Therefore, the exchange is highly reputable and implements the highest standards of cyber security. UpBit’s wallets are secured by BitGo, a highly secure and reputable multi-signature wallet provider trusted by international crypto exchanges. Also, account security is in line with Kakao Pay security measures. UpBit was recently accused of fraudulent activities in May of 2018 but have been cooperating with South Korean authorities and are thus far proven to be not guilty. All in all, UpBit is a very safe, secure, and fair cryptocurrency exchange. As you might suspect, UpBit offers customer support only in the Korean language as they primarily service Korean traders. However, the various support pages and helpful information can be translated using google translate. The FAQ page is quite extensive and is the best place to receive support for non-Korean speaking people. As for support for Korean traders, support representatives can be reached via email, telephone, and the KakaoTalk messaging app. Generally, the level of support is very good as UpBit employs many agents to provide quick and helpful responses. UpBit may be a relatively new cryptocurrency exchange, but they were not long making it to the top as the most liquid cryptocurrency exchange in the world with the highest daily trading volume. 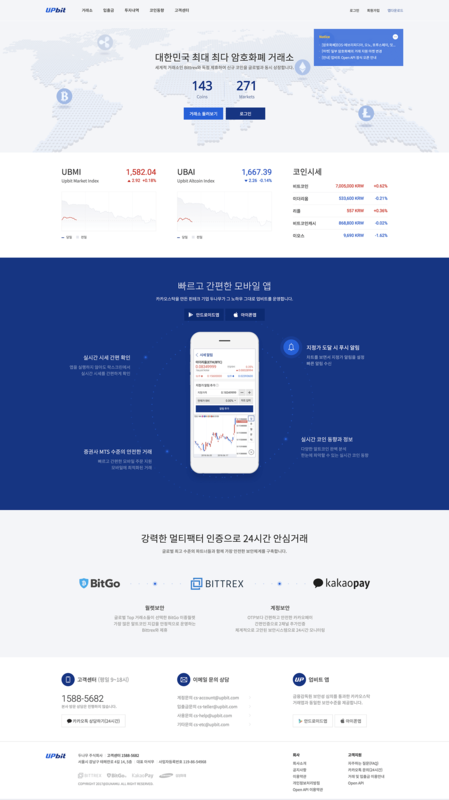 The UpBit crypto exchange primarily services South Korean traders but accepts traders from around the world. The exchange platform is highly sophisticated and familiar to Korean traders as it resembles the ever popular KakaoStock platforms. UpBit employs very high security standards, is trusted by many, and is compliant with local authorities and regulations. Overall, the UpBit cryptocurrency exchange is an excellent place to buy and sell a wide variety of cryptocurrencies. The following are the common questions that customers inquired about UpBit. No, it is not regulated. No, UpBit is a legit broker and who is trusted and used by many. UpBit is based in Seoul, South Korea at Gangnam-gu, Teheranro 4-gil 14, 5th floor. UpBit is recognized by many reputable establishments on the Korean Peninsula. They are a good choice for alt currency traders. UpBit is only for some traders. UpBit is the S. Korean crypto broker of choice for the region. They have reputable backing despite being new. UpBit isn't a great choice if you're not from S. Korea.